The latest expansion pack for World of Warcraft crushed the last 24-hour sales record set by the massively popular, massively online computer game, selling 3.3 million copies in a single day. 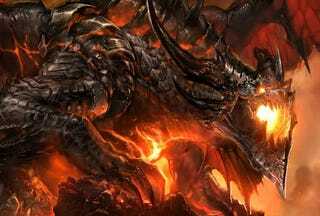 "We had to bring Azeroth to the brink of destruction in Cataclysm, but the result was our best expansion yet," said Mike Morhaime, CEO and cofounder of Blizzard Entertainment. "We want to thank all of our new, existing, and returning players throughout the world for their incredible enthusiasm and support, and we look forward to hearing what they think about all the new content." Despite those impressive numbers, World of Warcraft: Cataclysm still didn't manage to topple Call of Duty: Black Ops' record of 5.5 million copies sold in 24 hours when that game hit stores last month. Of course you don't have to pay a monthly fee to play Black Ops, and both games are under the same Activision Blizzard umbrella.